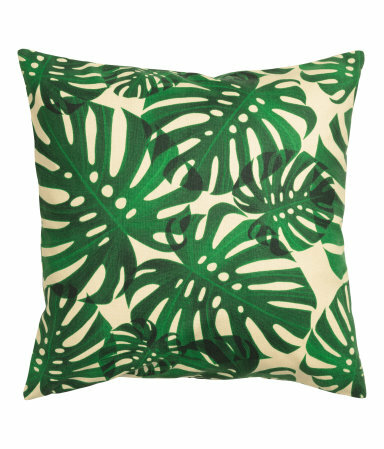 HOW TO GET ON THE MONSTERA TREND - HIP HIP HOME! Several months ago, I spotted a lonely little plant sitting outside a department store in the cold. The temperatures had dropped and it was practically left out there to die. Like any normal person, I quickly rescued it, loaded it into my toasty car, and gave it a warm home where it could hang out with it's other plant friends. I had my doubts if it would survive, but it did! That's how resilient this plant is. 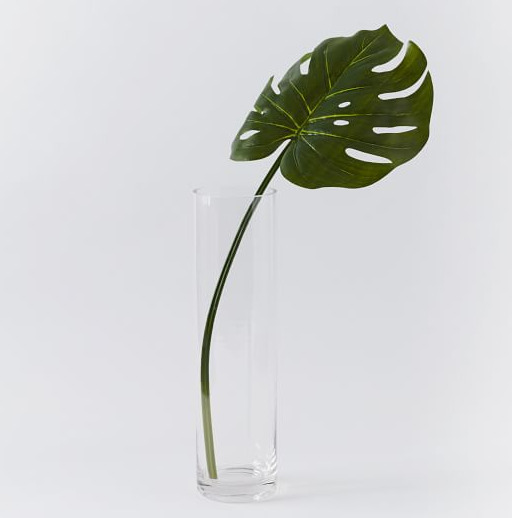 Anyway if you crave a Monstera, but don't have a green thumb or the space (lets be real, this one needs a lot of room) here are 4 ways you can get on the trend without committing to a real plant, just yet. I bought myself a faux monster leaf from Jo-Ann before I committed to the real plant. I still keep it around because its so beautiful. I have seen good ones at Michaels, West Elm and there are also tons of other options online. Just google. 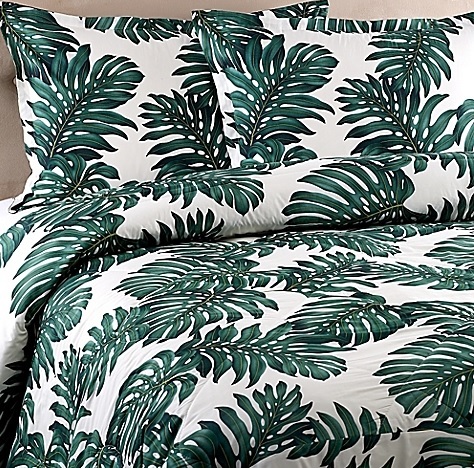 If you crave the forest look in the bedroom, awaken your inner Mowgli with this lush tropical bedding. To add just a small punch, try this pretty little throw pillow. This is one of my personal favorites. 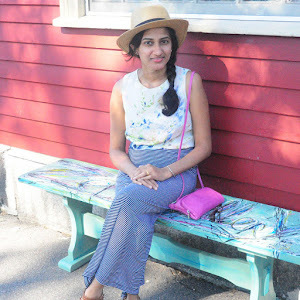 If textile is not your thing, there is always art. I love the watercolor paintings by Florida based artist Jenny Kiker of Living Pattern. Her work is beautiful and you can buy her prints online. 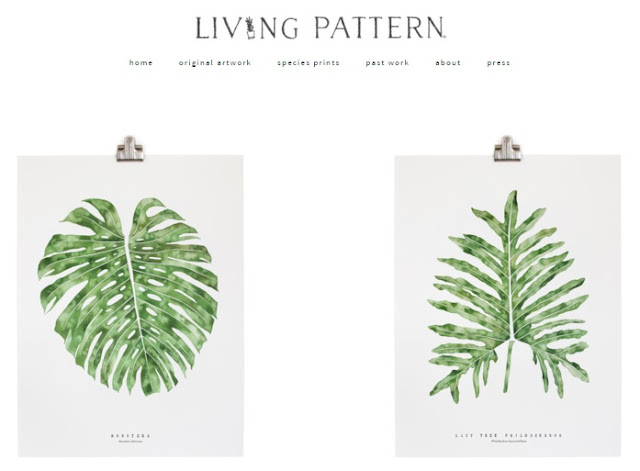 Do you love the Monstera as much as I do? She is beautiful! I love the faux leaf and the art! Great post Vin! I have a faux monstera, but wish i could grow the real thing. growing a monstera is not so difficult just try it ! I grow them proffesionaly so if you have a question just ask me. Hello! Thanks for taking the time to leave a comment! :) I do have one monstera, and I love it! I just went to your website, and you have quite the collection. I will certainly bookmark your email, for the future. Ha ha, that's a great idea - a little time in the water doesn't hurt I guess! I would be lying if I said I didn't consider water proofing a faux leaf's bottom.